One week ago today, we had “hunkered down” as best as we could, and prepared for what would become one of the largest and most disastrously widespread hurricane since they’ve been keeping records. Irma was huge. She packed a powerful punch, and she came through our town last Sunday evening and into Monday, leaving behind a trail of destruction, broken dreams, financial disaster, but thankfully, not a lot of lost lives. Well, we pick up the pieces. That’s what we do. So, back to our Monday morning overview. I was taking pictures as Ken and I were looking around for possibly dangerous downed power lines or other things to avoid. This is very normal... a HUGE pile of tree limbs. The main thing was indeed, the main thing. We had been mainly concerned about the winds, not the rain, that Irma would bring. Along with the winds would come downed trees. 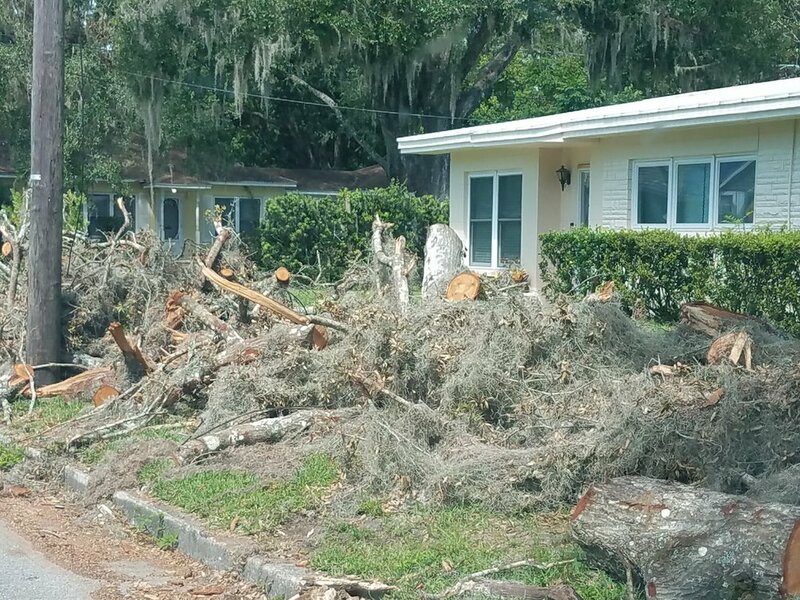 With the downed trees would come loss of power, land lines and cell towers. One week later, no one has sat down and put their feet up eating those proverbial bon-bons. Our community has come together. People who normally push pencils and pens for a living rented chain saws and ladders and went to work. Neighbor helping neighbor. Family helping family member. We saw some eager beavers that had their broken branches out by their road by 11 a.m. on Monday. Wow. We were still getting pelted with rain and wind gusts, but they had their branches neatly piled by the side of the road. We were still taking inventory of what we needed to do. After nearly 3 hours of checking on people and things (houses we own) and people from our church and their houses, we decided to come back, and start getting dirty. We had no power, and needed to get a game plan. One week later, now instead of a few piles of trees in a few yards, every where you turn, there are piles of trees. Where once stood a huge tree, crossing the road and blocking it on Monday, now stands a huge pile of tree. Upon closer inspection, I was incredibly thankful that the tree had covered the road, instead of tipping backwards and taking out the house right behind it. We had been unable to get close enough on Monday to see the destruction that had been missed by the tree falling into the street. Our yard looked as though someone had shaken tree branches all over the ground, creating a carpet of broken limbs. On Monday, we saw this picnic table, nearly covered in water in the middle of the retention pond. It’s not moved back into proper place today, but its legs are now visible, as it rises above the falling water. This picnic table is standing on ground now.. Even if it's still in the wrong place. We are incredibly thankful to have our stores open again. 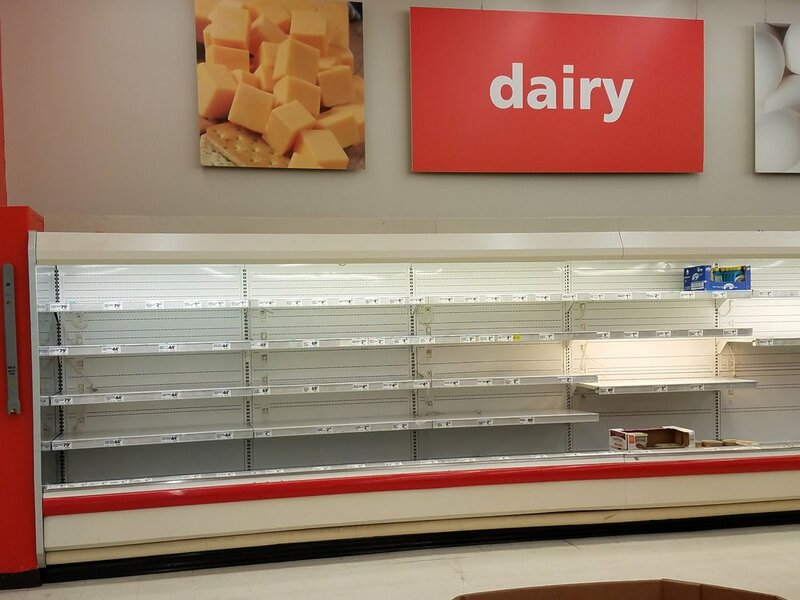 When they opened, I’m not sure why we thought that they’d have everything they had before Irma hit us. However, they don’t. 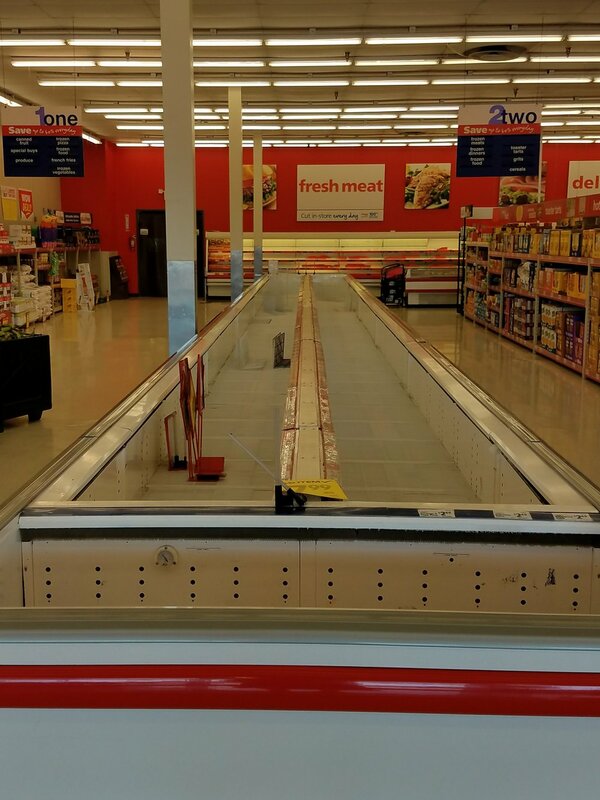 But, we have bread, even though the freezer shelves and meat shelves, at least at our local Save-a-lot, are empty. They are starting to fill them, as their trucks get here, but people can only work “so hard” and then they’re out of time. By the time Irma hit us, all gas stations had wrapped their tanks with plastic wrap, indicating that they were out of fuel, and preparing for the infusion of water. Today, the plastic is off, but at one gas station, the diesel is sold out and only the regular (87) is available. We’ll take it. Thank. You. Very. Much. Every time you go out for a drive, you see the likes of tree trucks and power trucks. They might say DUKE Power or Tampa Electric (TECO) or Withlacoochee Electric, (WREC), but they might very well say some company from Tennessee or Indiana. We love them all. Most of us have our power back. The ones struggling still without power are the ones who have poles down in their back yards, or way out in the country or on the other side of a flooded road. The only restaurant that I saw that was still closed along our “main drag” is our mighty McDonalds. However, they did get their sign fixed first thing on Tuesday morning! They seem to have some internal power or electrical problem that has been insurmountably unable to be fixed. Because most of us had power out for 2, 3 or 4 days, we lost our freezers full of food. However, we are grateful that we had freezers to be full, and, in fact, food that we had put in those freezers. However, most of all, you’ll see people helping each other. I stopped through a place called RESTORE HOPE today, as they gave away food and water and household items to those in need. No, it wasn’t milk, eggs, and frozen food. Why, no one can get that right now, but it was practical, needy and certainly appreciated. Standing in line at the post office, people are sharing pictures of how near disaster they were; showing trees blown over like dominos in a domino race. One lady showed me the video she took of water over the road out near our local park. I’m a perfect stranger to her, but she shared, and we all cared. Hurricanes are horribly powerful bursts of wind, water and power, but they bring with them some incredible things that create neighborhoods, and caring. These things can’t be bought. We saw the likes of: neighbors helping each other pulling branches off their roofs; neighbors letting the neighbors on a well, using city water, so he can shower or wash his hands; people with power opening their homes for those without to take showers or just cool off. So, we, too, will recover. We’ll pick up our pieces. The pieces of our lives that are broken. Some things we won’t recover. But, we came through it alive. And, hopefully stronger. Everywhere you go, you hear stories of how God Protected. Preserved. And Provided. We are no exception. We are acutely aware of how God protected us during this storm. By the time it got to us, it was downgraded to a Cat 1. The storm turned and went through the state just a few miles below us, meaning that we got the West side of the winds, instead of the more powerful and deadly East side of the ‘cane. Yes. We’ll be busy for weeks to come, picking up our pieces. Making things right. Replacing roofs, replanting trees, fixing windows, finding random things all over and putting them back. But, we’re up to the task. Thanks for your concerns. We appreciate your prayers and support. Additionally, we do appreciate the “hands” you’ve loaned us from all over the nation!